Flavors of sage, squash and mushrooms are so warm and comforting during the holidays! 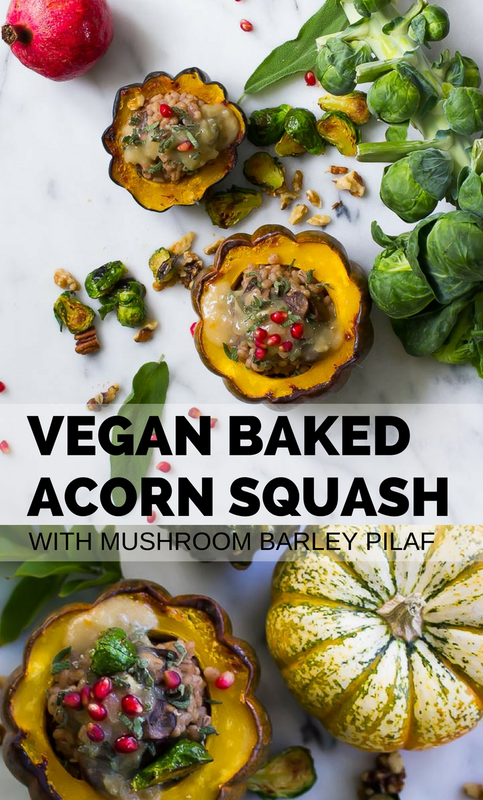 Dishes that celebrate the fall bounty are a perfect way to share a plant based lifestyle with friends and family. 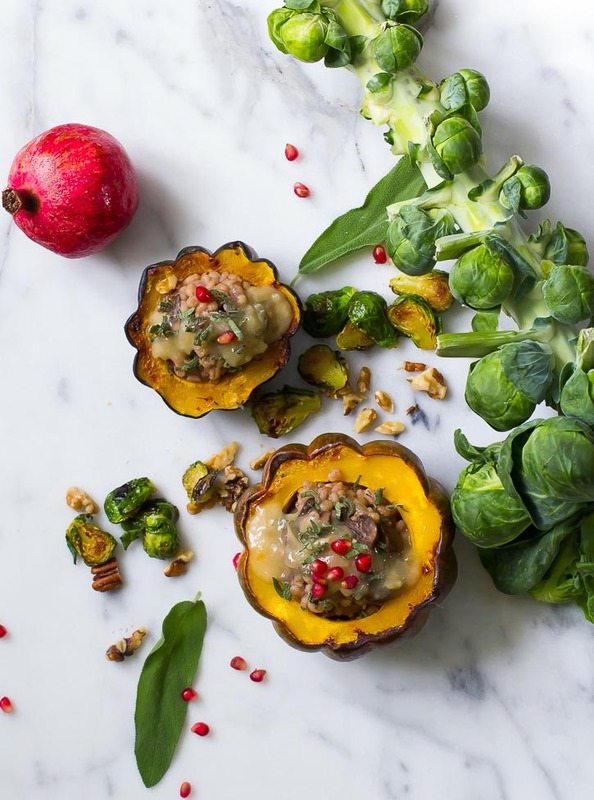 Stuffed acorn squash is a beautiful option for the harvest table, and is extremely easy to put together. 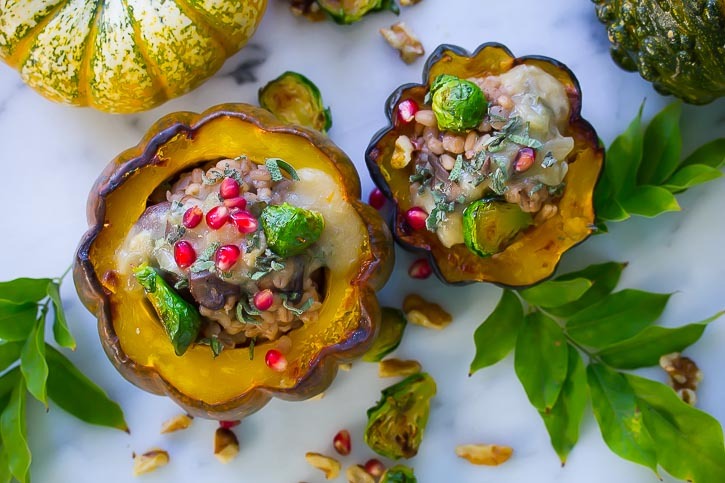 Acorn squash pairs well with the barley in the stuffing! Barley is a hearty grain with a chewy and dense texture. It’s particulary good with very soft and buttery squash. Sauteed mushrooms and onions, perfumed with fresh sage and thyme, combine perfectly with the barley. The easy gluten free mushroom gravy is perfect as a topping, but would be equally delicious on mashed or baked potatoes. 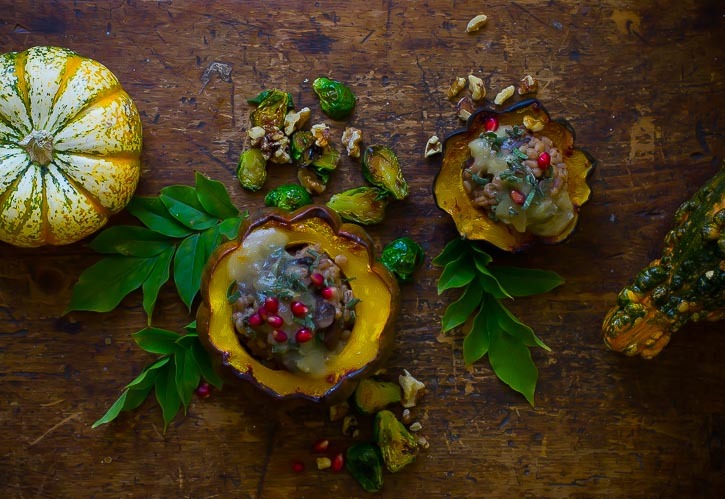 An easy and stunning recipe for the fall harvest table! Place cut side down on a baking sheet and bake for 1 hour. When done, remove from the oven and set aside until ready to stuff. In a large sauce pan heat the oil and add the onions, celery, carrots, garlic and dried mushrooms. Saute until vegetables are slightly browned. Add the Thyme and filtered water and bring to a simmer. Allow to simmer for 20-30 minutes. Strain and discard the vegetables and herbs, saving the stock for later. Heat the olive oil in a medium sauce pan and add the onion and garlic. Saute until just golden and then add the flour. Saute gently on low with the flour for 1 more minute. Add the stock and bring to a simmer. Whisk mixture well to remove any lumps. Simmer for 10-15 minutes, whisking frequently. Sift in the potato starch a few minutes before the end of the cooking time to help the gravy thicken. Cook longer if you like a thicker gravy. Heat the olive oil in a sauce pan. Add the mushrooms onion and garlic. Saute until golden. Add the barley and 2 cups of the mushroom stock. Bring to a simmer. Turn down the heat to low and allow to simmer for 20-25 minutes. Gradually adding more stock as needed. When the barley is done it should be tender, but still has a natural chewiness! All the liquid should be cooked off. Avoid stirring the mixture too frequently during the cooking process. At the end of the cooking time, season to taste with salt and pepper. Add the chopped pecans and herbs. Stuff the barley mixture into the hot baked acorn squash. Top with gravy and pomegranate seeds. ooops sorry it’s 1/4 cup! I’ll correct it.